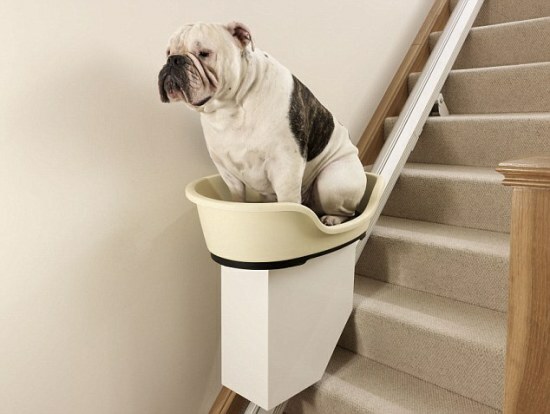 The British pet insurance company, MORE TH>N, recently designed a prototype of the world's first stair lift for fat dogs, supposedly to emphasize to dog owners that their dogs are getting fatter by the year. At the current rate of growth of fat dogs, more than 50 percent of British dogs will be so fat by the year 2022 that they won't be able to carry out basic tasks. Thus, the 'Stair of the Dog 2022' was designed. But the design prototype looks like it was built very realistically, not as an 'example' or a joke. 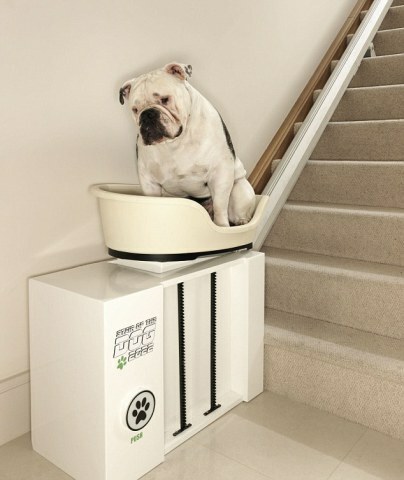 Apparently two companies have already expressed interest in manufacturing and selling the dog lift. At bottom, the fat dog gets into the basket and pushes a button with his paw, if he can lift it. Slowly, the basket rises straight up a few feet betore it begins its diagonal ascent up the stairs. What a life! But seriously, don't you think a dog diet is a better idea for a fat dog? 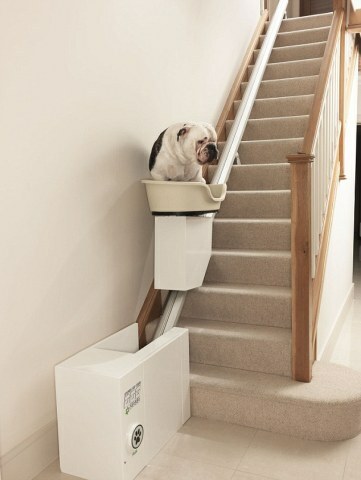 Although I can definitely see the use of the Stair of the Dog 2022 for handicapped and elderly pups.